This section is intended for those who chose to handcraft or build their own yurts. For information on platform plans, go to our FAQs section and visit the yurt company websites. 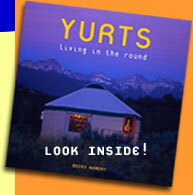 To learn more about yurt assembly, peruse the Yurt Assembly section on the Photo Links page. The Complete Yurt Handbook by Paul King, Ecologic Books, 2001. Yurt builder Paul King provides detailed instructions on how to make both Mongolian and Turkic yurts. Mongolian Cloud Houses: How to Make a Yurt and Live Comfortably by Dan Kuehn, Shelter Publications, 2006. Construction details for an authentic Mongol ger. A beautiful handmade book with samples of wood, felt and canvas included. Factsheet on building a Turkic style yurt by Welsh yurt craftsman Steve Place of Handmade Hardwood Yurts. In 2005 Rene K. Muller built his own traditional ger and these are his notes, along with a Yurt Calculator for the dimensions of yurt components. An amazing resource! Paul King, author of The Complete Yurt Handbook, has a set of plans for a Mongolian style ger available online at no charge. They may be printed from the site in two parts. SCA (Society of Creative Anachronism) members build own their yurts as an historical exercise, with an emphasis on simplicity of design, mobility and traditional authenticity. SCA members generously share information, but these designs may not be appropriate for year-round living. The Mongolian Yurt, Part I and The Mongolian Yurt, Part II may be downloaded from the SCA Publication Sacred Spaces. The Construction of a Yurt Online paper written by SCA member Monica Cellio with details on yurt specs and components. How we made our own Gher Notes from an SCA project. The Coxes’ fabric yurt plans are designed for year-round habitation and use modern materials. However, the plans have not been updated since their original release and will not resemble recent designs produced by yurt companies. Info for ordering Bill’s plans can be found on the Dickinson’s Reach page. There are no plans available for frame panel yurts per se. However, Smiling Woods Yurts sells plans for the frame panel walls along with a metal roof kit which can be assembled onsite. Frame panel walls are relatively easy to build if you have carpentry experience. This is a helpful way to economize while avoiding the complexities of the circular roof. Geo-Lite Systems sells DIY plans for their 12, 14 and 16-panel yurt-style dwellings.